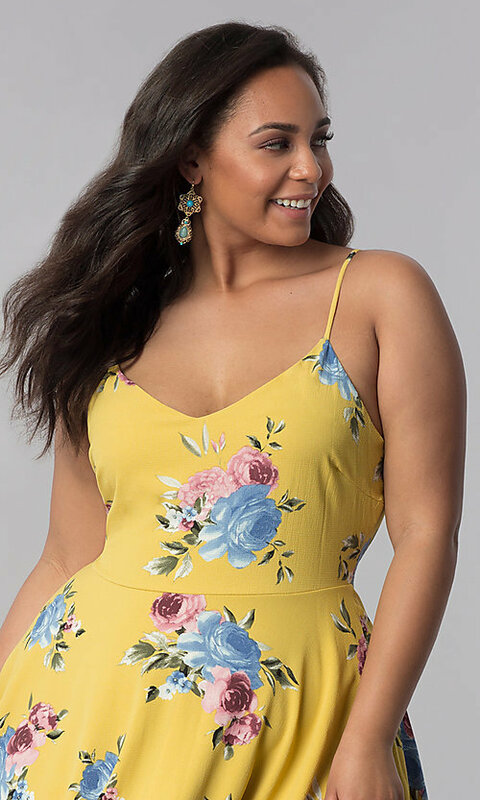 Look casually cute in this sleeveless plus-size party dress with an adorable floral print. Eye-catching soft blue and pink flowers pop from every angle of this short plus-size dress, while a statement-making corset-tie back sets the style apart in a sultry way. Adding to the appeal, the scoop neckline of this short casual dress makes the look perfectly modest without overdoing the degree of coverage. Even better, a small seam at the natural waist helps define the figure and a flirty circle skirt makes the design of this party dress in plus sizes completely irresistible. The model wearing mustard is 5'9".